Teacups and Cake: Time Flys! I was very upset that Gossip Girl was old last night ( I hear that it might be new on CW which I don't have :( so I will be stocking youtube for it). So for the past few weeks I have been racking my brains trying to figure out who Catherine was on a different show. My friend finally pointed out that she was Sherry from Gilmore Girls. I was like OHHH YA!! haha, and I call myself a major fan. If you just listen to her voice you can tell right away. Spooky, (Sookie, haha okay no) oh well it just gave me another reason to hate her. haha. So I have talked about Mark by Avon before and I just got another one of their catalogs and I can't help but love some of their stuff. 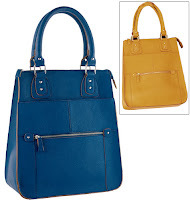 I love the shape of this bag, and the bright blue colour, it also comes in yellow as you can see. It is only $30! This sweater/wrap is great. It cab be worn so many different ways ( I like it the way it is shown in the big picture and open the best). It has so many possibles and can be worn with a ton of different things. Its $28. I find that Mark products all can be worn with many different things, and many different ways, which means that they will fit into a bunch of different wardrobes. I love the versatility of it. I hope that you all have a great week. I must get back to my homework. I will post my Thanksgiving post this weekend. I will have time then. I hope you enjoyed my crazy last minute post for this week. Ohyes, I nearly cried when I saw that it was a repeat! Sigh. I was hoping to see how Blair gets her throne back!!! oh my goodness, I'm so late on gossip girl! I like the wrap shirt. I loved that episode of GG. Avon... sells... good clothes... WHAT?! LOVE that bag! Also love that Blair always matches her headbands perfectly to her dresses... I need to work on that skill! OH. I had only watched the episodes with whatshername recently, and she DID look familiar. I should've known it was Sherry. I was the biggest Gilmore Girls fan too. Good call on that one!